After twenty-two years as a Mac user, I switched to Windows 10. I was motivated by excellent hardware that became available (the Dell XPS 15 specifically). Macbook Pros had remained stagnant for years and I wanted a larger, better screen. I do a lot of photography, so 4k and the Adobe RGB colorspace were quite compelling! While I was excited for the hardware, I was nervous about the OS. I had played with Windows in the past and was always underwhelmed. I was scared my web development productivity would plummet, and I dreaded losing important software. It turns out I was wrong. My web development workflow on Windows 10 is as productive as it was on OS X, and I continue enjoying the same software to develop PHP on Windows. I tell this story to my fellow PHP developers, and they look at me like I’m crazy. Just a few years ago I would have agreed with them—maybe even a few months ago! However, I must commend Microsoft for its progress on Windows 10. I find Windows 10’s aesthetics simple and well-designed. Windows 10 is stable with the “Threshold 2” update. And my new Dell XPS 15 Core i7 Skylake laptop is powerful and packed with pixels. I am happy with Windows 10. Perhaps most interestingly, based on my own experience, the difference between OS X and Windows continues to shrink. Both borrow good ideas from one another, and more and more software is cross-platform or web-based. This post covers what I learned during the transition from OS X to Windows 10 that is relevant to PHP developers. It turns out there isn’t much to relearn, and you don’t even lose the command line! This list should be familiar because it is the same software I used to develop PHP on OS X.
It’s important to emphasize that I heavily rely on Vagrant virtual machines to preview my local applications through an environment that matches their production servers. I would do this even if I developed in Linux. A development machine is never going to exactly match a production machine the same way a scripted Virtual Machine can. It is silly to not virtualize production environments regardless of your local OS. Windows, OS X, and even Linux users should all use a virtual machine to preview local applications and avoid software discrepancies with production servers. So when evaluating a development OS, the only consideration is the development experience. This post demonstrates that Windows 10 is finally a capable platform for PHP development. Whether you are building custom applications or contributing to your favorite open source projects, Windows 10 is finally a sane choice as a modern PHP development platform. What follows is a collection of what I’ve installed to get going on my Windows development machine. The PHP internals team provides pre-compiled PHP binaries for Windows. These binaries are available to download at http://windows.php.net/download/ for both 32-bit and 64-bit operating systems. I use the 64-bit (non-thread-safe) PHP 7.0 build for Windows 10. The thread-safe builds are intended for PHP developers running a local Apache web server. The non-thread-safe builds are intended for PHP developers running a local IIS web server. I do not run Apache or IIS. Instead, I use PHP’s built-in web server or a Vagrant virtual machine when developing applications on my own computer. It is important to download and install the Visual C++ Redistributable that complements the selected PHP binary. I use the x64 VC14 C++ Redistributable required by the PHP 7.0 binary. The PHP pre-compiled binary is a ZIP archive. I extract it to C:\Users\josh\Apps\php7.0\ on my computer, and I add that directory to the system PATH environment variable. I recommend the following changes to the php.ini file located immediately beneath the PHP install directory. The zend_extension value must be the exact filename of the .dll file. This name may vary depending on the specific Xdebug build. The second line, xdebug.default_enable, activates Xdebug by default. The xdebug.scream directive instructs Xdebug to ignore the @ suppression operator. The xdebug.coverage_enable directive activates Xdebug’s code coverage feature that often complements PHPUnit tests. The xdebug.profiler_enable directive disables Xdebug’s profiler feature by default since it consumes a lot of system resources and disk space on every PHP run. The xdebug.profiler_enable_trigger directive, however, lets me selectively activate Xdebug’s profiler by passing the ?XDEBUG_PROFILE=1 query parameter to a PHP script. The xdebug.profiler_output_dir is the path to a directory in which Xdebug stores profiler output data. Profiler data can consume a lot of disk space. The xdebug.remote_enable directive activates Xdebug’s remote debugging features. The xdebug.remote_host and xdebug.remote_port directives tell Xdebug the host and port to which Xdebug sends debugger information. The PHPStorm IDE listens on 127.0.0.1:9000 for inbound Xdebug debugger information. I use PHPStorm with PHP 7.0 and Xdebug. PHPStorm is a popular integrated development environment (IDE). 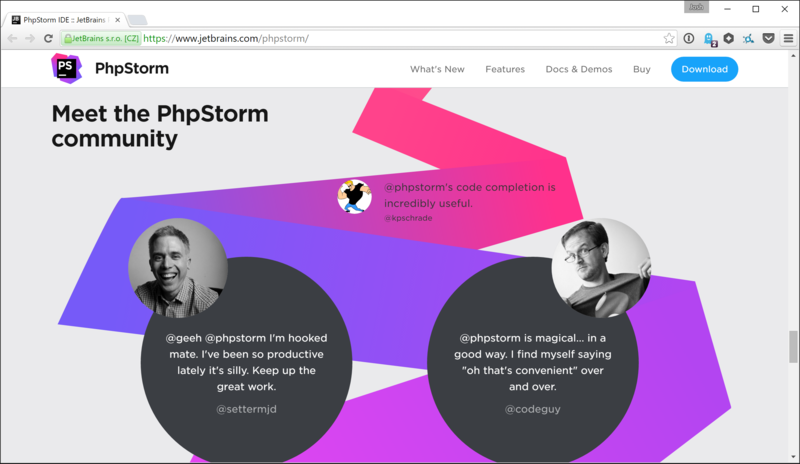 It is commercial software availble via subscription at https://www.jetbrains.com/phpstorm/. I never appreciated PHPStorm until I did most menial development tasks by hand. Only then did I learn to love PHPStorm. There is comfort and simplicity in its perceptually complex user interface. I won’t go into the details; PHPStorm’s features are listed on its website. I do, however, appreciate PHPStorm’s support for PHPUnit, Xdebug profiling, Xdebug code coverage, Composer, and PHP Code-Sniffer. To configure a new PHP 7.0 interpreter in PHPStorm, I open PHPStorm's settings window (Ctrl+Alt+s) and navigate to Languages & Frameworks > PHP and click the … button located to the right of the Interpreter dropdown. In the subsequent window, I click the … button to the right of the PHP executable text field and select the C:\Users\josh\Apps\php7.0\php.exe executable file beneath the PHP install directory. PHPStorm automatically finds and reads the php.ini file. PHPStorm also recognizes the Xdebug extension. Finally, I navigate to Languages & Frameworks > PHP > Debug to ensure the Xdebug Can accept external connections checkbox is checked and the Debug port value is 9000. These settings tell PHPStorm to listen for inbound Xdebug debugger data on 127.0.0.1:9000. Composer is a PHP dependency manager that is often attributed as the catalyst for the modern PHP renaissance. Composer changed how I develop PHP applications. It’s an invaluable tool that I use everyday. Composer provides a native Windows installer on its website at https://getcomposer.org/download/. The installer puts the Composer binary in the C:\ProgramData\ComposerSetup\bin\ directory, and it puts global vendor packages into the C:\Users\josh\AppData\Roaming\Composer\vendor\bin\ directory. After I add the C:\Users\josh\AppData\Roaming\Composer\vendor\bin\ directory to my system PATH environment variable, I can invoke any Composer-managed global binary in the command prompt. In PHPStorm, I specify the path to the PHPUnit executable in the settings panel (Ctrl+Alt+s). I navigate to Languages & Frameworks > PHP > PHPUnit. I click the Path to phpunit.phar radio button and enter the C:\Users\josh\AppData\Roaming\Composer\vendor\bin\phpunit PHAR archive path in the Path to phpunit.phar text field. PHP Code Sniffer provides code linting against the PSR-1 and PSR-2 code styles (among other features). PHPStorm uses PHP Code Sniffer to lint code in real-time with inline notifications of syntax and style mistakes. I install PHP Code Sniffer with Composer. In PHPStorm, I specify the path to the PHP Code Sniffer executable in the settings panel (Ctrl+Alt+s). In navigate to Languages & Frameworks > PHP > Code Sniffer. I click the ... button and, in the subsequent dialog, select the C:\Users\josh\AppData\Roaming\Composer\vendor\bin\phpcs.bat file for the PHP Code Sniffer (phpcs) path text field. PHP Mess Detector detects messy PHP code, including “unused variables, bugs, suboptimal code, or overcomplicated expressions” according to its website. PHPStorm uses PHP Mess Detector to lint code in real-time with inline notifications. I install PHP Mess Detector with Composer. In PHPStorm, I specify the path to the PHP Mess Detector executable in the settings panel (Ctrl+Alt+s). I navigate to Languages & Frameworks > PHP > Mess Detector. I click the … button to the right of the Configuration dropdown and, in the subsequent dialog, select the C:\Users\josh\AppData\Roaming\Composer\vendor\bin\phpmd.bat file in the PHP Mess Detector (phpmd) path text field. I admit that I miss a familiar bash shell and an underlying BSD subsystem. However, Git Bash is a competent bash substitute on Windows. Git Bash is a psuedo-bash shell on Windows that provides oft-used bash commands and transparently maps them to their DOS counterparts. Git Bash, as its name suggests, also provides the Git version control system complemented by a built-in SSH client that operates exactly like it’s Unix-y brethren. The SSH client uses ~/.ssh/id_rsa and ~/.ssh/id_rsa.pub private and public SSH keys, and it uses a ~/.ssh/config file for SSH connection aliases. Git Bash is available for download at https://git-scm.com/downloads. As you can see in the screenshots above, I run Git Bash via Cmder, a Windows user interface that wraps nicely around Git Bash, the native Command Prompt, or PowerShell. Many of my friends who use OS X and Linux carry negative preconceptions of Windows, especially with regards to PHP development. These were true. I recently switched to Windows 10 after twenty-two years with a Mac, and I believe these negative preconceptions of Windows are now false. All of my software runs on Windows. I write PHP with a stellar IDE using the latest and greatest features available in PHP 7.0. I also run Xdebug, the de facto PHP debugger and code profiler, to analyze and optimize my PHP code. I step-debug my code in PHPStorm when I run into otherwise tricky-to-diagnose issues with my PHP code. I write PHPUnit tests and generate real-time code coverage statistics so I know which code is tested and which is not. I use PHP Code Sniffer and PHP Mess Detector to ensure my code is efficient and adheres to PSR-1 and PSR-2 code styles. I run all of these tools in a familiar bash-like terminal with Git and SSH not unlike my previous OS X development environment. Yes, I was hesitant moving to Windows. My time developing PHP on Windows 10, however, is efficient, familiar, and productive. Windows 10 supports the tools I need to create and deploy modern PHP applications. How have you gone with doing Docker dev on Windows? (I note your previous Docker posts). @Mathew I still rely on Vagrant for most of my day-to-day work. I experimented with Docker a while back, but still not comfortable enough to use it full time. Docker has improved drastically since I last used it though. @Tomás Thanks! Will correct. Good catch. @PK I use CrashPlan for incremental file backups and versioning. Works great. @PK - I'd disagree with the backup statement. Windows has had great backup options built in for years. Look in the control panel under backup and you will find 2 tools for this. 1. System Image Backup -> This will make a complete image of your machine to any drive or even network storage. If you need to reload your OS simply boot to the windows USB, select "recover from backup" and point it to your drive or network location of your backup image and it'll pull everything back the way you had it last. 2. File History -> Give it a list of folder you want it to monitor and tell it where you want it backed up to. It will keep a history of changes to all files within those folders and store them where you want, as frequently as you'd like. I was a Windows user for 22 years, until I switched to OSX a couple of years ago, thinking it would help my overall web development pipeline, but now I spend so much time battling Apple's appalling window and file management, I'm very seriously considering switching back! The one thing that would make me stay would be the Macbook's trackpad, but I hear the new precision trackpad on the XPS is a thing to behold. Would you care to share your experience of using it, particularly on the road where you don't have the luxury of multiple screens, and perhaps using Windows 10's gestures? Well, its a nice post. I prefer Windows, always. Tried a lot of times other OS's but they cant do easy things like Windows do. Try this software. Website is only in russian but the software has installer and interface in English. The software is called OpenServer and automatic do everything you did and much much much more. Website is open-server.ru - Some times i think. (Russian software = virus) Lol. But not. This openserver wow... its just magic. Wamp, Xaamp, Uwamp etc... they are all a trash if you compare with this openserver. Great article, I found some of the tips really useful so thanks for sharing your experiences. I think the availability of Ubuntu bash could be a good complement to PHP development on Windows. Total time: : 15.414 sec. Total time: : 31.471 sec. Both are on i7 skylake 4 core 8 thread 2.6ghz, server running on ssd 850 read, php file on hdd (i think in singlle php file it does not really matter). Running n battery with max execution limit. I have did not tested on unix kind of OS, but if i need to choose w10 bash vs iis vs wamp/xamp i choose iis plus php. I also switched from many years Mac to Windows. I'm, very happy and would never go back to Mac as things are now. Actually there are many things that really annoy me on the Mac/OSX. Win 10 is really nice and clean, and so is the hardware I use. First of all, thank’s for a very interesting article! I am in the process of switching to Windows 10 and have some questions related to this and PhpStorm IDE together with Docker and Docker for Windows. I recently bought a new laptop with Windows 10 and decided to reevaluate my development environment at the same time as I switch laptop and OS. I’m however not switching from Mac but from Windows 7 64 bit, using Sublime Text as editor and running a virtual machine, Virtual box with Ubuntu and LAMP-stack, in Windows. Codeception is used for automated tests. My code is stored in a directory in Windows and is mirrored, when making changes (by using Sublime SFTP), on the virtual machine. Codeception is run on the virtual machine. During the week I have both read this article and a couple of articles on using Docker and Docker Compose (one of these also written by you :). What I’m looking for is to find a good way to create a local development environment which do not deviate from staging and production environments and at the same time effectively work with my PHP code. • the images for the Docker containers which I use are included in version control by including them in the Bitbucket repository. • Can I achieve the above by installing and using PhpStorm IDE as you have described in your article along with installing and using Docker and Docker for Windows to create development, staging and production environments? I have a Dell 7559 that have lots of problems to get it work on a linux enviroment, after some try and fail succesfully installed Ubuntu 16, almost everything was working fine until some kernel and driver updates my ubuntu got useless. I decided to try Open Suse (Used in the past with another Dell computer), I dont got installed because Open Suse was having trouble booting. After I decided to use Manjaro, It was working fine but I was using a 70% of my gaming laptop because graphics card was not functioning, I waste a lot of time trying to fix a lot of things. One thing I dont like about linux is the exessive fragmentation, tons of computer to be compatible with, I run with the bad luck of having one that have problems running linux. "Many of my friends who use OS X and Linux carry negative preconceptions of Windows" this is the worth thing I read since a long long time. They are just sheeps that follow the mass of criticise-ms-is-cool whatever they know or not was going on behind the system or behing their own mistakes. They can't event understand not everyone are up to go in command line each time they need to make updates, install a driver or configure something (mostly Linux/BSD), OSX is for sure more user friendly but that's the other extrem side, you're just stuck in what Apple think is good for you. I totally agree that Windows 10 has improved A LOT, not only for (web) developers to work on but in every possible ways and that the negative perception that was once legitimate is not anymore. My dev environment slightly differs from yours in that I use Docker instead of the Vagrant solution and VSCode (the Microsoft open source IDE) which I'd recommend anybody to test. I don't even miss my Bash since PowerShell gives me as much control but in an object oriented way (thanks to the underlying .NET framework) which I come to appreciate more than the traditional "one purpose - one command" philosophy. Although I didn't take this approach, it's worth mentioning the WSL (Windows Subsystem for Linux) which basically translates Linux system calls into Windows system calls. This allows any Linux distro to run NATIVELY on Windows which make it possible to get extremely easily a Linux dev environment on your Windows machine. Dude. You do know that all the softwares you have mentioned do exist on Mac and the Mac versions are for some of them are better than their Windows counterpart. If you ever decide to go back on Mac, let me know and I will give you tips about development tools that will make you happier that you think you got when you switched to windows.